Have you ever gone to the driving range and see golfers swing so hard that they are completely physically spent after each swing? You know, the ones that are dripping with sweat after hitting 10 balls and grunt after every swing as if they are trying to break through a concrete wall? Now, have you ever watched golf on TV? Have you ever paused for a moment at the range and watched someone who is hitting the ball with consistency? I'd be willing to bet they are not grunting, sweating, or trying to prove to themselves and everyone watching that they are swinging harder than everyone else! I've taken golf lessons before, and I consider going back to an instructor from time-to-time. 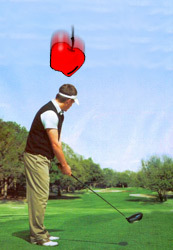 One of the guys I play with is very "anti-golf lessons". His argument is that most golf instructors try to teach you how to swing from scratch, and try to make your swing conform to that "universal perfect golf swing". In some respects I think he's right. I like to compare a golfer's swing to a baseball player's swing...although the ball is moving in baseball, the object is the same; to hit the ball. And I believe that it doesn't really matter what kind of path your swing takes, so long as you make solid contact and it produces desired results. 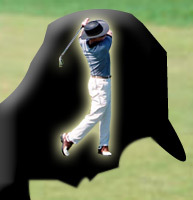 A golf swing is made up many different parts. Everything from your grip to your stance, and anything with your physical body, to external factors like wind and pin placement, all make up how you approach your swing. Every swing will be different somehow, and one of the challenges of golf is being able to readily adjust your swing according to the challenges faced. The game of golf is filled with emotional highs and lows. Indeed each round consists of good runs and disappointing runs when you consider how well you are hitting the ball. When you hit a good shot it can carry you on an emotional and confidence high for a few holes. Alternatively, when you hit a bad shot, all your confidence and composure can be lost. The question remains though, which comes first when you play a round of golf? Hitting a good shot (success)? Or the confidence to hit a good shot? Are you interested in keeping your golf stats online, for free? The KeepMyGolfScore.com golf score tracker has you covered! 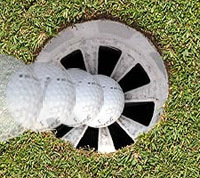 Sign up for our golf tips enews! Keep your golf scores and track your handicap online, for free!